Pandora.com is set to block all web traffic that comes from outside the United States. The popular site streams music based on a users' preferences to help people discover new bands. The move follows pressure from record labels who say that Pandora does not have a licence to broadcast music to countries other than America. In fact Pandora has always stated that its service was only available to US music listeners. However, many canny web users have been able to access the service simply by entering a false US address into the site. "It's devastating for us to have to do that. We're terribly disappointed and frustrated, but the existing law right now is such that we can't legally stream to most users outside the US," Tim Westergren, founder of Pandora, told The Register . Pandora starts working when you enter a song or a band name which you particularly like. The site will then queue up a playlist of songs from that band along with those from bands which are musically similar. Users can then give feedback by giving the thumbs up or the thumbs down as to whether they like the recommendations or whether they think the similarities are not good enough. This feedback is taken into account by the site when it makes recommendations in the future. But all is not lost quite yet. The legal team behind Pandora are striving to agree licences with record companies to allow the service to continue in countries outside the US. And while these endeavours are going largely unrewarded, the one country where headway is being made is the UK. 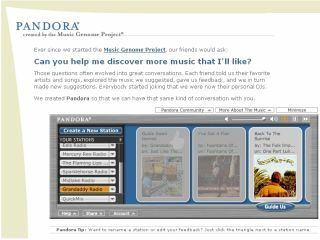 Pandora was built by the Music Genome Project .